Whether you’re looking for a quiet spot, need room to spread out and work, or like to have technology on hand, we’ve got you covered. And Ed’s Coffee Shop can satisfy that coffee craving, too. Reserve a spot to get work done and choose from a wide array including group study rooms, classrooms and workstations in the Mulva Studio. State-of-the-art technology isn’t just present here, it weaves its way into your overall experience. Enter the library and you’re greeted by tools ranging from computer pods with dual screens to TV/Audio Studios. Explore our library through our photo galleries. Need to see the library’s layout before your visit? 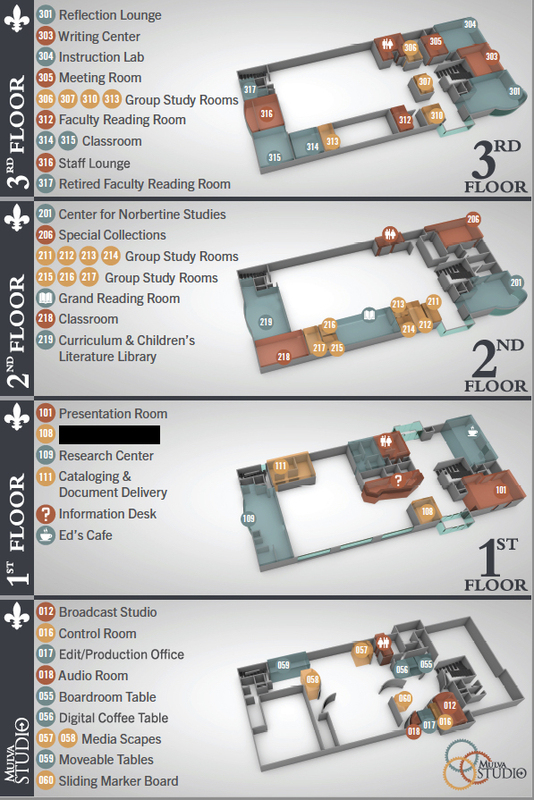 Check out our four-level floor map. Looking for a spot to study, reflect or recharge? Use our Study Spaces App to find your favorite areas in the library and across campus!